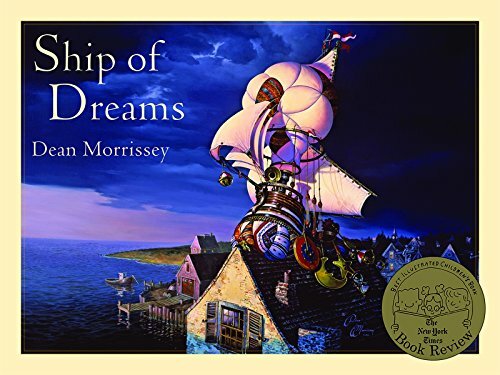 Before even opening the book Ship of Dreams by Dean Morrissey, the cover illustration is enchanting, luring, and curiosity piquing, beckoning one to a realm of dreamy fantasy and nostalgia. This reprinted edition of a story that was so well received in 1994, selling 400,000 copies and winning illustration awards, really is a stunning piece of artwork. Morrissey has a distinct artistic style that has been well received in other books as well including The Great Kettles: A Tale of Time and The Christmas Ship. The very first illustration in the Ship of Dreams tosses the reader into the world of a bygone era. A well-worn wooden wagon, bedecked by a sail made from an old copper tea kettle, a #2 lead pencil, a red and white striped reindeer bell, and a checkered flag are all intentionally rigged for adventure. An alphabet letter block, a billiard ball, and old skeleton keys dangle off the sides of the wagon. All of this is set upon a faded and weathered nautical chart. While this illustration begs one to linger and wander around the painting, at the same time, it is compelling one to turn the page; adventure awaits. The story opens with Joey, in bed yet wide awake thinking about the Sandman, a character he heard about from his friend Henry. Young Joey is intrigued and determines to stay awake to meet this elusive and mysterious Sandman. Joey does his best to stay awake by planning his encounter with the Sandman and making a list of all the items he would pack in his Redd Rocket wagon: a map, animal crackers, string, grapes, an apple, a compass, etc. Joey succumbs to sleep before long, and his adventure with the Sandman begins. The Sandman turns out to be the spitting image of a Victorian Father Christmas complete with long white beard, wire-rimmed reading spectacles, and rosy cheeks. He even has reindeer bells stashed all around his flying ship and is surrounded by toys and gadgets in his land-based workshop. It is a little disconcerting that Morrissey created a twin of Santa. Blessed with an abundance of imagination, could Morrissey not have created a unique and distinctive Sandman? To further the confusion, a bold letter S embossed on a tag could easily be mistaken for Santa’s initial. Throughout the story, the strange sentiment follows, could this really be Santa’s off-season job, doubling as a sleep-inducing Sandman? The reader continues on in dreamy travels along with Joey, getting answers to his plethora of questions, assisting the Sandman with his nightly routine. As they sail around the world in a flying ship, part hot air balloon, part Captain Hook pirate ship, Joey learns about spreading sleeping sand, hanging stars in the sky for all the newborn babies, and collecting shooting stars to grind into more sleeping sand. He learns about the Sandman’s workshop, he learns about his own personal birth star that hangs just above his own house. As he wakes in his own bed, Joey then learns that he had dreamed the entire thing—or did he? The suspension of disbelief is encouraged by a final illustration. Joey’s own Redd Rocket wagon is now outfitted with the very map, animal crackers, string, grapes, apple, and compass he had thought about when he was first falling asleep. Joey now has quite the story to tell Henry—or will he? It might be too special, too intimate to share with anyone. While the plot and characters in Ship of Dreams remain quite ordinary, and we are told many things in some awkward dialog moments, Morrissey’s endearing quality is undeniably shown in his illustrations. There is so much available to the reader within the pictures that the storyline has an opportunity to take on an entirely new life, restrained only by the imagination of the reader.